ATLANTA (February 26, 2015) – Girl Scouts of Greater Atlanta has once again teamed up with Simon Malls throughout the metro area this cookie season to offer customers an even easier way to purchase Girl Scout Cookies. Now through Tuesday, March 10, Girl Scout troops will be hosting Girl Scout Cookie Booths between the hours of4 - 7 p.m. Monday-Friday; 10 a.m. - 9 p.m. on Saturdays and 12 - 6 p.m. on Sundays at the following three Simon properties in Georgia: Mall of Georgia, Northlake Mall and Town Center at Cobb. Girl Scout troops will also host a Cookie Booth at Lenox Square between the hours of 4 - 7 p.m. Monday-Friday; 10 a.m. - 9 p.m. on Saturdays and 12 - 6 p.m. on Sundays until Monday, March 2. Monday-Friday, 4 p.m. – 7 p.m.
*Lenox Square will host a Girl Scout Cookie Booth through Monday, March 2. Girl Scout Cookies include: Thin Mints, Samoas, Trefoils, Do-si-dos, Tagalongs, Savannah Smiles and the new Toffe-Tastic (Gluten Free) and Rah-Rah Raisins. Each cookie variety sells for $4.00. 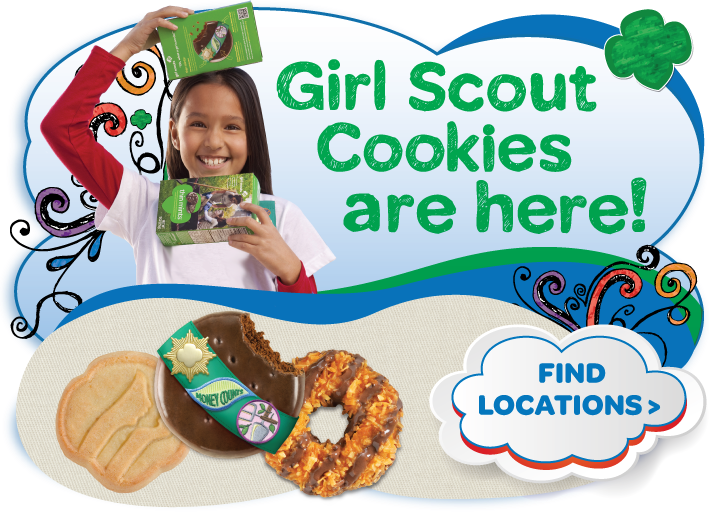 For a list of other cookie booth locations in your area, visit the COOKIE LOCATOR at www.GirlScoutsATL.org to search by your city or county. New locations are posted daily. Also, check out the free mobile app that can be downloaded to your iPhone, iTouch or android device by calling **gscookies! Many Girl Scout troops will have mobile credit card readers this year, making it easier for the cashless customer. About Girl Scouts of Greater Atlanta, Inc. Girl Scouts of Greater Atlanta, Inc. serves approximately 42,000 girls and over 18,000 adult members in 34 counties in the greater metropolitan Atlanta area, northwest Georgia and Polk County, TN. Girl Scouting’s mission is to build girls of courage, confidence and character, who make the world a better place. For more information on how to join, volunteer or donate to Girl Scouts of Greater Atlanta call 1-800-771-4046, or visit www.gsgatl.org. For information on the national organization visit Girl Scouts of the USA’s Web site at www.girlscouts.org.